The Fox Theatre, or The Fabulous Fox as it's sometimes called, opened its doors on December 25, 1929, less than two months after the Stock Market crash that heralded the arrival of The Great Depression. 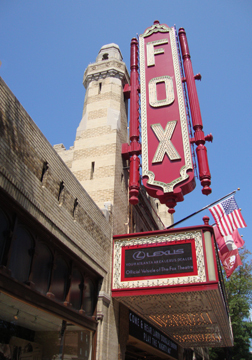 Following a brief closing in 1932 and near demolition in the mid-1970s, the Fox today holds many local and world record distinctions and is listed on the National Historic Landmarks registry. A tour of the Fox is more than a walk down memory lane; it's a behind-the-scenes look at one of the most majestic, highly-attended, historically-rich theatres in the country. The tour took us to numerous spaces within the Theatre that one usually would not encounter in a single visit. We ventured to the Egyptian Ballroom, the Grand Salon, the Grand Terrace, the Men's and Women's Lounges and Restrooms (not something that's on every tour! 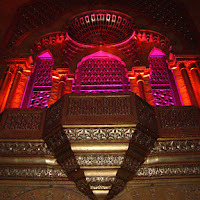 ), the main theatre, and attended a private performance on the "Mighty Mo" organ by none other than Larry-Douglas Embury, the resident organist. The kickoff of the tour indeed started on time, as advertised on the Fox’s website. Our tour began at the entrance arcade on Peachtree Street. 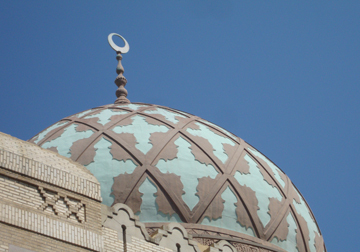 Our tour guide, Ellen, was very personable and obviously finds great pleasure in sharing information about the Fabulous Fox, which included the 1970s "Save the Fox" campaign and details about its Moorish, Egyptian and other architectural styles. After a briefing of historical tidbits, we were escorted to the Egyptian Ballroom, named for its Egyptian-inspired décor (a worldwide trend following the 1922 discovery of King Tut's tomb), which served as a public dance hall in the 1930s. Today, the Egyptian Ballroom is used for wedding receptions, proms, corporate events and special occasions. Adjacent to the Egyptian Ballroom—also available for special occasions—is the Grand Terrace, which offers a degree of privacy for event-goers with just enough of skyscrapers peeking over the Terrace walls to remind one that they are not attending a Pharos' birthday bash, but are indeed still in the heart of Atlanta. Also adjacent to the Egyptian Ballroom, but with its own private entrance, is the Grand Salon, which features a remarkable and substantial stained glass ceiling. Much of the Fox's ballrooms were restored to their original grandeur during the "Fix the Fox" campaign in the 1980s. A surprising detour that turned out to be a sight worthy of seeing was a visit to the Women's and Men's Lounges and bathrooms. 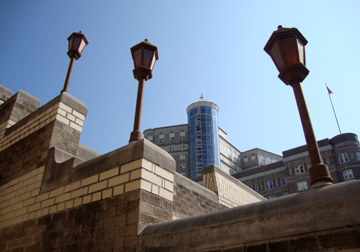 Ellen described the various design elements in the rooms and shared a number of historical facts, including that women did not smoke in public during in the Fox's early years, but instead would venture out to a "smoking terrace" accessible from the Women's Lounge. Much of the furniture and other décor in the lavish and grand lounges are originals from the 1929 opening of the Theatre. Before I discuss "Mighty Mo" and the main theatre I can tell you that our tour finished with a visit to the Spanish Room—originally the practice room for Fox Theatre musicians—which today houses many concessions windows and includes a modest size gift shop. Now, let's get back to the main theatre and "Mighty Mo." 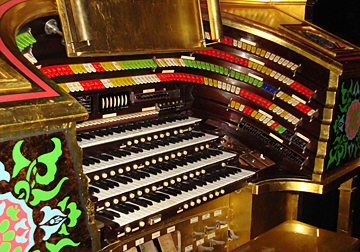 It just so happened that the day we were touring Larry-Douglas Embury, the Fox’s resident organist, was in attendance to play "Mighty Mo" for a group of 140 school children. We had the distinct and rare pleasure of joining Larry for a private performance. Larry talked about the vast infrastructure of the organ and pointed out the illuminated organ pipe housings flanking the main stage. He was fantastic with the kids and conducted a question and answer session for the children after describing and playing quite a few numbers on "Mighty Mo." After completing his mini-concert, he lowered Might Mo from its lofty perch to eye-level so that the kids and my tour group could snap a few photos. We were then off to the balcony of the main theatre so we could get a better glimpse of the Theatre's remarkable "night-time" ceiling. The lights are embedded in the ceiling and covered with crystals. The close-up view of the main stage, even that close, did not convey the size of the 8-foot lampposts or the 14-foot hanging pendants near the top of the Theatre, but fortunately our tour guide did. She also pointed out that the giant canopy that more than covers the balcony is constructed of plaster and steel beams—a perfect illusion. Also worthy of mentioning for tourists on a budget who would like to attend a "show" at the Fox is the annual Coca-Cola Film Festival. 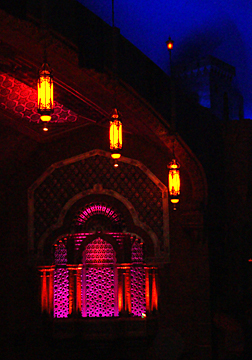 Each summer, for less than the cost of a mainstream cinema movie, patrons can experience the grandeur of the Fox Theatre and see a classic or box office hit movie on the largest screen in Atlanta. The movie experience includes a sing-along, classic cartoon and the movie. Will I take the Fox Theatre tour again? I definitely recommend taking this tour at least once. Personally, I know there is much to know about the Fox and I find it all fascinating, mostly because of my love for the building and its remarkable history. Their website is full of interesting factoids and historical recantings of events...and one can always find a book in the gift shop that provides considerably greater detail about the Fox Theatre. Saturday – 10 a.m. and 11 a.m.